Hi guys! It's time for Sepia Scenes again. The badge above is new and it's yours for the taking. Just right-click and "Save image as" to your Desktop. Then use it in your post. Two quick shots along the Brooklyn-Queens Expressway (under the Brooklyn Promenade) from the passenger seat. A little photo-editing, added a layer mask and then used Color Dodge in Adobe Photoshop 7. Don't forget to sign Mr. Linky, leave a comment and, most importantly, visit other participants. I'm posting early in the day on Wednesday for today and tomorrow so our bloggers around the world can join us! Oh wow... I'm really loving that Lower Manhattan scene. The contrast of open space against the backdrop of the high rise buildings is awesome. Every week I find I really look forward to this day! I love that cityscape and bridge view, perfect in sepia! I was just in New York many photo ops! 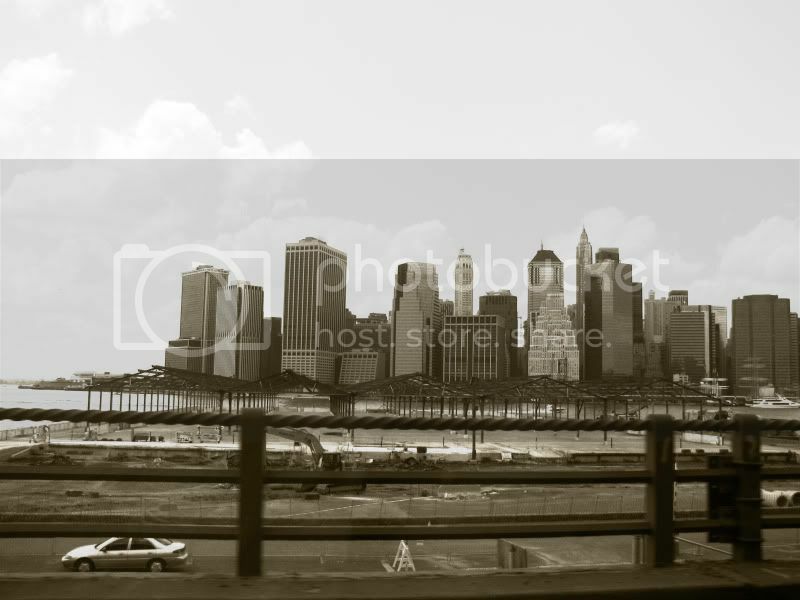 NY looks good in sepia! Now that school is out I will have more time to post!! NYC is so completely timeless. Take the cars out of the photos and these pictures could fall into a different times. I was intrigued by the series of buildings being erected in the second photo - warehouses perhaps? You're amazing Mary, these photos are so well balanced and composed. I love them. I hope you're having a good week. Take care. 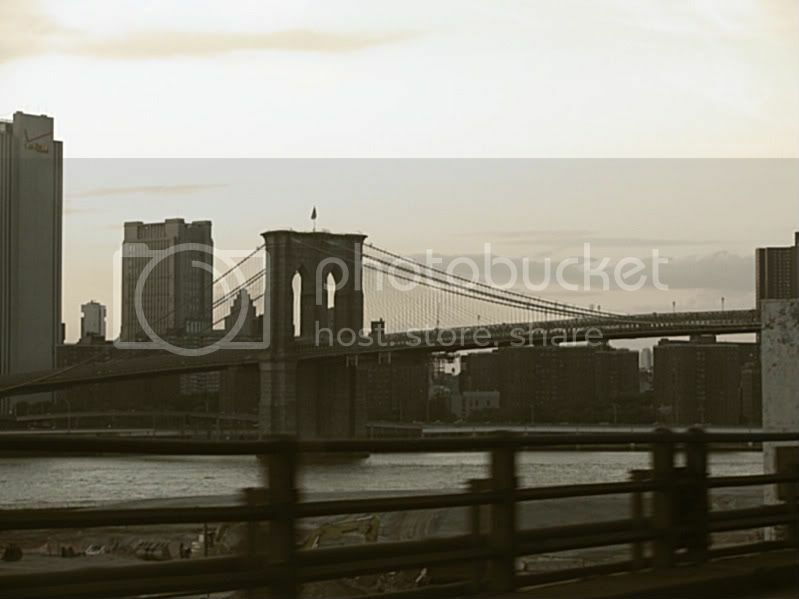 Love the pics, especially of the Brooklyn Bridge. I've never been to NYC, and love seeing pictures of other people's visits there. This is my first time playing! The shot of lower Manhattan and the Brooklyn bridge is nice in sepia. Both photos are great Mary. I have never seen the Brooklyn Bridge or Lower Manhattan. These look like they could have come from an old travel book! I have to make a return trip to NY to fully enjoy the city that has endless offerings. Teach, I have NY posting today too. Hope you like it. Oh,I love that second one. I sure need to learn to play with Layers. You did a good job on these! The slightly out of focus railing in that second shot gives a great sense of movement - I kept imagining traffic rushing by on the bridge. It's nice to 'see' those things we hear about on TV! I hope to get there someday but in the meantime I thank you for sharing your world. I love the tone of these images Mary! The Brooklyn Bridge: this has to be the classiest icon of the 1800s. The style, with the stone arches looking so right. And the lace of cables supporting the roadway are so structurally sound after 126 years is a testament to the Roebling family and their engineering prowess. A sound design with artistic touches, no bridge anywhere comes close to this majestic span! Really great shot. They look great in Sepia. Yeah! Mr Linky is fixed! Very cool Mary I like these a lot! Great photo's. It looks so much more mellow in sepia. Magnificent street scenes in sepia! I love your shots, Mary. Have a wonderful day, everyone :). Love all the shots! But that one of Lower Manhattan is fascinating highlighting each subtle change of tone of each skyscraper! Manhattan in Sepia!! What a great idea! I'm playing this week, if you're interested to see how a traditional beehive is made, my Sepia Scenes is up! Beautiful scenes Mary! The cityscape is GREAT!!! I love the slightly blue sky it really brings out the strong features of the bridge and the skyline. 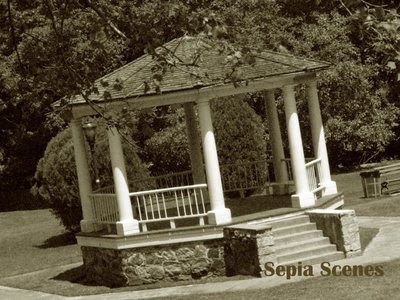 Hope you can stop by to see my sepia scene and window views Thanks! What lovely photos! I love the Brooklyn Bridge setting.